Are underground lunar settlements viable? building on the lunar surface, or looking for a pre-existing underground chamber which can be made airtight. In recent years there has been growing interest in the second approach. In particular the search has been on for suitable lava tubes which might be of substantial size in the areas of interest for a permanent settlement. There are a number of good reasons for this. It would mean that the need to transport material to the site for building purposes would be much reduced. An underground location is likely to be inherently safer against both meteor strikes and solar and cosmic radiation than a surface site. Making an appropriate lava tube habitable may involve little more than building an airtight door at the entrance to the tube. A sufficiently large lava tube would allow for expanding the settlement at little more cost than transporting people and their immediate technological needs there in the first place. It is no surprise therefore that a lot of effort has gone into identifying suitable lava tubes. These lava tubes are fairly ancient structures left over from a time when the Moon was geologically active. As the name implies they transported molten lava from the Moon’s interior to the surface and were key to forming the great lava plains of the Moon’s Seas (Maria). 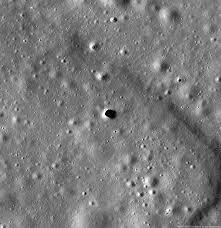 The entrance to these lava tubes would show up as pits on the lunar surface and a number of these have been identified from photography of the Moon’s surface. The photo shows a pit, initially discovered by the Japanese Kaguya spacecraft which is believed to be the entrance to a lava tube 65 metres wide and 80 metres deep in an area of the Moon known as the Marius Hills. The Lunar Reconnaissance Orbiter has photographed over 200 of these pits which show signs of leading into lava tubes. Current best estimates say that these pits lead to chambers with diameters from 5 to 900 metres although there is no reason, in principle why some of these caverns could not measure several kilometres across – large enough to encompass a whole city. The problem to date is that all of this has been inferred from looking at the surface of the Moon and its sinuous rilles in particular. There has been no hard proof of the existence of these chambers. Developing better information on where these lava tubes are and their size and whether they exist at all has become an important piece of research and data from the GRAIL mission is starting to shine a clearer light on these issues. The Grail satellites collected detailed data on the gravity variations on the Moon. The photo shows that there are quite wide variations in gravity across the Moon’s surface. This information allowed a team of scientists at the Aeronautics and Astronautics Department of Purdue University in Indiana, led by Rohan Sood to get a better idea of what the Moon’s interior looks like and, in particular, the expected buried lava tubes. Changes in the Moon’s gravity reflect changes in the amount and density of the material in the area being measured. In the area of the Marius Hills where the hole shown above is located they found the signature of a subsurface cavity. They also found signatures for at least a further ten features that could be lava tubes, spread across the surface of the Moon and close to ancient volcanic seas. Some of these signatures indicate tubes measuring more than 100 Km’s long and several Km’s wide. The team announced their results in a paper – Detection of Buried Empty Lunar Lava Tubes Using Grail Gravity Data which they presented to the 47th Lunar and Planetary Science Conference in Texas. As they point out in their paper this is not a definitive proof of the existence of these lava tubes because of a mismatch in the size of the tubes versus the Grail data. It is however a strong indication of their existence and points to some of them at least being far larger than had previously been thought. In the end it is likely to take a mission with ground penetrating radar to finally confirm the existence or otherwise of these lava tubes, something that might be possible with the upcoming LAROSS mission. It is certainly something which is exciting the proponents of a subsurface lunar settlement.